As one of New Zealand 's best known fly fishing guides Chappie explains the passion that he has for fishing.
" I caught my first fish at age six. It was not a trout, but I discovered fly-fishing at thirteen. Where I grew up, there was a mountain, from whose graceful slopes flowed no fewer than three hundred streams, most of which held trout. Some of those streams were small, and that's where I started to learn my craft. 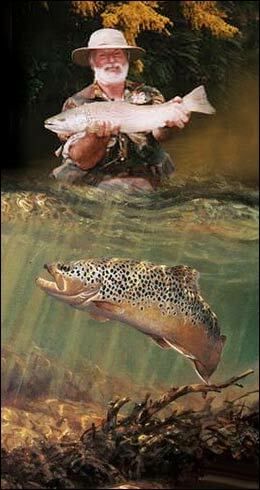 To this day my preferred fishing, is with a dry-fly in a small stream. In the mid 1970's I did something that was considered radical (at least in those days). I sold up and quit my job, brought a 4WD vehicle and a caravan, and went fishing for the next three and a half years. I guess if you do something for long enough, you are bound to get proficient at it sooner or later! I have been guiding anglers for over twenty years, although that has not always been a full time job for me, as it is now. I spent a good number of years in the fishing tackle industry, both at wholesale and retail, during which, I have had the opportunity to be involved with design and development of some of the more popular brands of fly-fishing tackle on the market today. In addition to fly fishing guiding, I run about twenty five, two day fly-fishing schools at introductory to mid level, and about five or six three day advanced level.